After the successful siege of Tyre, Alexander continued southwards along the Aegean coast. All the cities in his path yielded to him except Gaza, which was situated atop a high rock and extremely well fortified. He needed to conquer it before proceeding into Egypt. After a two month siege the city fell and all male citizens were killed while the women and children were sold into slavery. Then he continued southward into Egypt, having secured the entire Aegean coast. The Persian satrap in Egypt wisely decided that trying to stop Alexander would be useless so he was welcomed as a liberator from the hated Persians and made Pharaoh. It was here that he founded the city of Alexandria. Below is a "detail of a monumental statue of Alexander the Great from Luxor. The king is portrayed wearing the traditional royal headcloth (nemes)of the Egyptian Pharaoh, with his characteristic curls shown in Greek style at the forehead. The statue was probably made during Alexander's reign."1. 1. Alexander the Great, Son of the Gods, Alan Fields and Joann Fletcher, The Paul Getty Museum publication, pg. 54. He had now secured the Greek mainland from any possible Persian naval attack. It was now time to move to the heart of the Persian Empire. 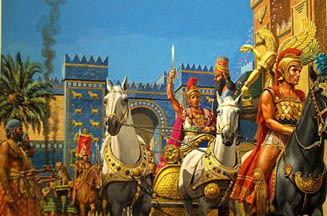 Alexander left Egypt in the middle of 331 BC in pursuit of Darius. He conquered the lands between the rivers Tigris and Euphrates and found the Persian army at the plains of Guagamela, (near modern Irbil, Iraq). For Darius this would be a do or die situation because if he lost this battle, it would be the end of the Persian Empire. He had already been defeated at Granicus and Issus. He chose his battle on a level plain so that he could most effectively utilized his vast cavalry, which was his main force. On the morning of October 1, 331 BC, the two armies met on the battlefield at Guagamela. A furious battle seesawed back and forth until a gap opened in the Persians right center and Alexander led a charge straight at Darius as he had done at the Battle of Issus. There was fierce hand-to- hand combat with the Macedonians proving superior. Darius felt threatened with Alexander and his elite forces so close to him and decided to flee. And, just as at Issus, when the Persians saw their king fleeing, they decided to do the same. The Macedonians swept through the Persian forces and slaughtered them. At the moment of Darius departure the battle was far from decided. Although Alexander had forced an important break-through with his heavy cavalry, just as at Issus, Darius fled far too early. His left wing and most of his center was still intact and both parties would most likely have had an equal chance of success if Darius could have closed the gap in the left center and assembled his right wing again. The results of the battles of Issus and Guagamela might have been completely different if the Persians had a more determined high king. However, once again Darius had escaped because Alexander was occupied in concluding the battle. The heart of the Persian Empire was now open to Alexander and he turned southward where he obtained the surrenders of Babylon and Susa and fought his way into Persepolis, the capital of the Persian Empire. 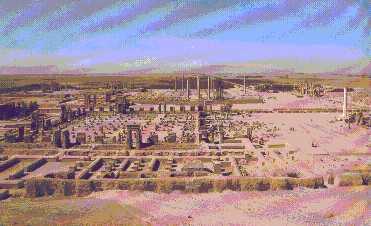 After resting his troops there for several months, he burned and completely destroyed Persepolis. Some historians say this was to avenge the Persian invasion of Greece and the sack of Athens in 490 BC. Leaving Persepolis, Alexander pursued Darius, now a fugitive in his own country, for hundreds of miles. When he finally caught up to him, he found the Persian king dead in his coach, assassinated by his own officers. Alexander had the assassins executed and gave Darius a royal funeral. Alexander had himself proclaimed high king of Persia and sent letters to all of the Greek cities proclaiming that he had rid Asia of tyranny. Now, it was on to India.